Interpersonal sensitivity refers to the accuracy and/or appropriateness of perceptions, judgments, and responses we have with respect to one another. It is relevant to nearly all aspects of social relations and has long been studied by social, personality, and clinical psychologists. Until now, however, no systematic or comprehensive treatment of this complex concept has been attempted. 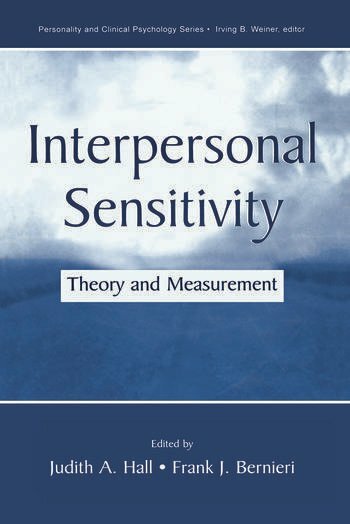 In this volume the major theorists and researchers of interpersonal sensitivity describe their approaches both critically and integratively. Specific tests and methods are presented and evaluated. The authors address issues ranging from the practical to the broadly theoretical and discuss future challenges. Topics include sensitivity to deception, emotion, personality, and other personal characteristics; empathy; the status of self-reports; dyadic interaction procedures; lens model approaches; correlational and categorical measurement approaches; thin-slice and variance partitioning methodologies; and others. This volume offers the single most comprehensive treatment to date of this widely acknowledged but often vaguely operationalized and communicated social competency. Contents: R. Rosenthal, Foreword. Preface. Part I:Theoretical Issues. F.J. Bernieri, Toward a Taxonomy of Interpersonal Sensitivity. S.H. Losoya, N. Eisenberg, Affective Empathy. Part II:Assessing the Performance of a Perceiver. C.R. Colvin, M.J. Bundick, In Search of the Good Judge of Personality: Some Methodological and Theoretical Concerns. F.J. Bernieri, J.S. Gillis, Judging Rapport: Employing Brunswik's Lens Model to Study Interpersonal Sensitivity. N. Ambady, D. LaPlante, E. Johnson, Thin-Slice Judgments as a Measure of Interpersonal Sensitivity. B.E. Malone, B.M. DePaulo, Measuring Sensitivity to Deception. Part III:Toward the Creation of an Interpersonal Sensitivity Test. R.E. Riggio, H.R. Riggio, Self-Report Measurement of Interpersonal Sensitivity. J.A. Hall, The PONS Test and the Psychometric Approach to Measuring Interpersonal Sensitivity. D. Archer, M. Costanzo, R. Akert, The Interpersonal Perception Task (IPT): Alternative Approaches to Problems of Theory and Design. S. Nowicki, Jr., M.P. Duke, Nonverbal Receptivity: The Diagnostic Analysis of Nonverbal Accuracy (DANVA). Part IV:Dyadic Interaction Approaches. S.E. Snodgrass, Correlational Method for Assessing Interpersonal Sensitivity Within Dyadic Interaction. W. Ickes, Measuring Empathic Accuracy. P. Noller, Using Standard Content Methodology to Assess Nonverbal Sensitivity in Dyads. D.A. Kenny, L. Winquist, The Measurement of Interpersonal Sensitivity: Consideration of Design, Components, and Unit of Analysis. Part V:Where Can We Go From Here? R.E. Riggio, Interpersonal Sensitivity Research and Organizational Psychology: Theoretical and Methodological Applications. D.C. Funder, Three Trends in Current Research on Person Perception: Positivity, Realism, and Sophistication. L.A. Zebrowitz, Groping for the Elephant of Interpersonal Sensitivity. H.S. Friedman, Paradoxes of Nonverbal Detection, Expression, and Responding: Points to PONDER.